Practical Zach and his inventive sister Lucy open a yoga studio for all of their friends in this sweet Level 3 Ready-to-Read that proves that even if your space is small, your imagination doesn’t have to be. One morning as Lucy and Zach watch their mom do yoga, they decide they should teach a yoga class for all of their friends! The siblings find a studio space in their building’s basement, set up lots of soothing decorations—potted plants borrowed from the lobby—and put down the “yoga mats” (really door mats) they found all over the building. Then it’s time to begin! 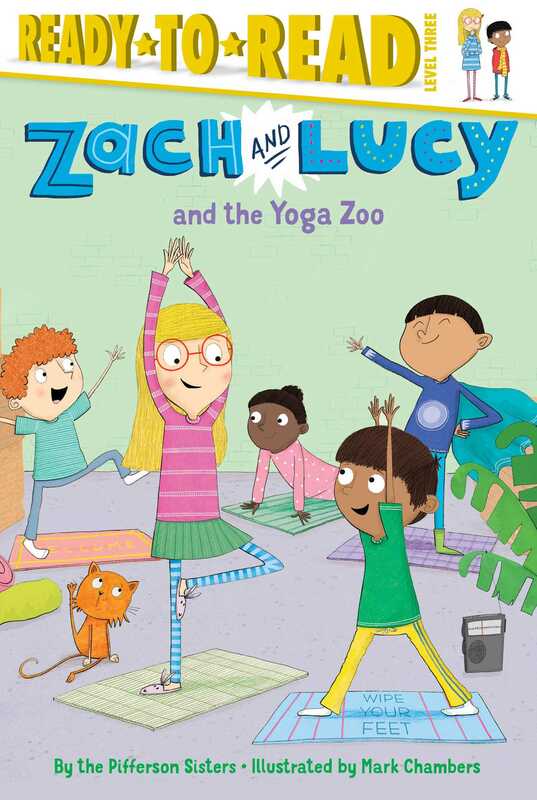 Zach and Lucy don’t really know how to do yoga, but from what they’ve seen, it involves pretending to be lots of different animals…right? The Pifferson Sisters are Jennifer Bradbury and Stephanie Guerra. Jennifer is the author of the middle grade novel River Runs Deep. She lives in Burlington, WA. Stephanie is the author of the middle grade novel Billy the Kid is Not Crazy. She lives in Seattle. Mark Chambers has illustrated numerous international books and products. He graduated from the Lincoln School of Art and Design in the United Kingdom. Mark currently lives and works in London, England.